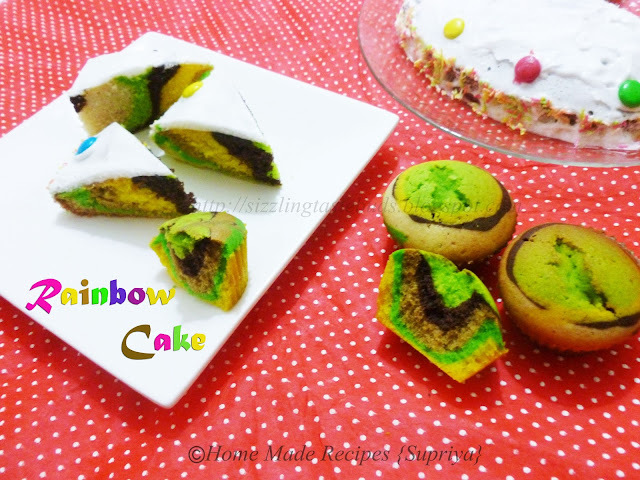 Its again a post on baking. Last week was my little boy's "HAPPY BIRTHDAY". He started planning for his birthday from last 3 months. But all his friends had gone out of the city since its their summer vacation. Poor boy! just like me, he too will never get a chance to distribute chocolates on his birthday in school. Ever since I baked a heart shaped Choco- Walnut cake for my hubby on his birthday, my son started complaining that I never baked a cake for his birthday and this time he too wanted a heart shaped cake on his much awaited birthday. It was a hectic week, and we already had ordered a surprise CHOTA BHEEM cake for our darling son. So, I decided to go with a Rainbow cake. I also baked his favorite Tutti Frutti cookies. Please follow the recipe of my Vanilla Cupcake here. Prepare the cake batter. Divide it into 4 to 5 equal portions. Mix different food colors to each portion like green, yellow, saffron, cocoa powder (brown). Leave one portion plain to get a off-white color in between. 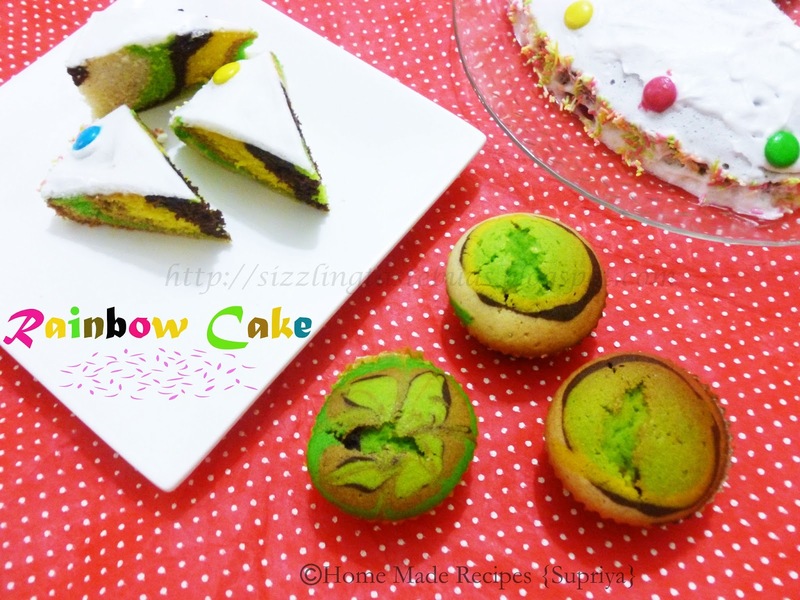 Its similar to the way I baked Zebra Cake. 1. 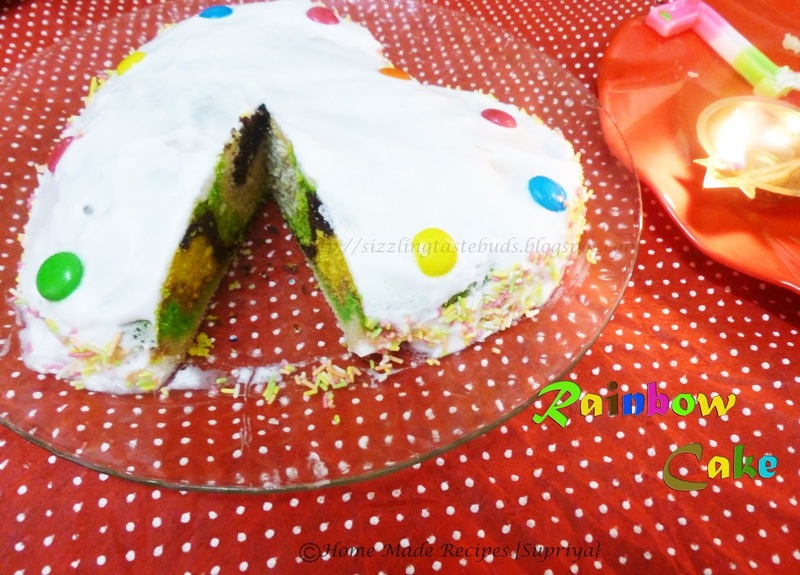 Lightly grease the round or heart shaped cake tin with little oil or line it with a parchment( baking) paper. 3. Once done, carefully keep it in an oven at 180C for 45 mins. Cake is ready when a tooth pick inserted in the center comes out clean. 4. Remove the cake from the oven and carefully run a knife at the sides of the tin and invert it on a plate. Once cooled, decorate it with your favorite icing. I decorated it with whipped cream and Cadbury Gems. 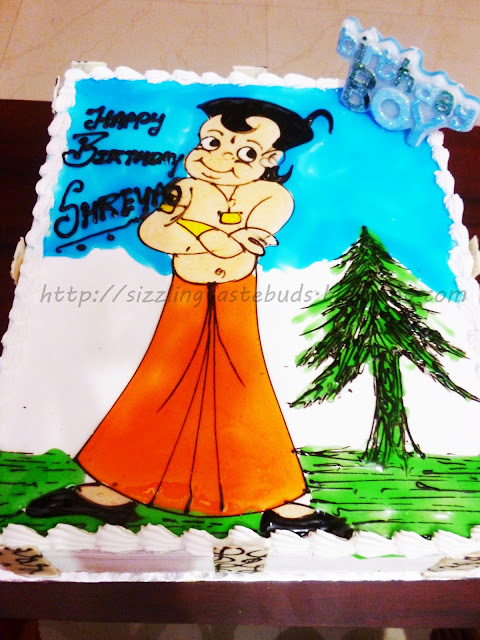 And now here's the Black Forest Chota Bheem Cake we ordered for our birthday boy.